Saturday morning markets are held most weekends in either Collie, Donnybrook or Balingup. There is nothing Mumbles is better designed for than relaxation. Curl up with one of our books of short stories or poems, or finish the one you started last time you had a chance to unwind. Sit on your private verandah with a cuppa or a glass of wine and watch the world go slowly by, or indulge in the luxury of your hot tub spa, and let the world get by on its own. Explore the block at your own pace; make a splash in the lake or make friends with our gentle alpacas. Enjoy a picnic over the water; choose from the gazebo on the main lake or our beautiful and secluded "Willows" deck on the minor one. Sit in the shade and watch the fish swimming lazily around beneath you, or watch the swallows fishing as the sun goes down. Linger in the gazebo for an evening BBQ with a backdrop of lights across the water, twinkling in the ripples of the splashing fountain (in cooler months you'll need a jacket and a bottle of red). As night falls, admire millions of stars set against the blackest sky you will find anywhere. Do your skin a favour; sample the range of "Mumbiessence" luxurious soaps and natural skin care products, which are hand made right here at Mumbles. Back in the sanctuary of your apartment, keep up with your favourite TV, watch one of our top movies, or challenge your partner to any of the board games provided. Perhaps you've got better things to do! If you arrive at Mumbles in daylight you will as likely be welcomed by a raucous chorus of wattlebirds as you come up the driveway. At last count we have over 60 bird species; you will see many of them from your verandah. Most striking are the local parrots; Port Lincoln parrots, western rosellas, red-capped parrots and the smaller elegant parakeets. All of our cockatoos are black (white tailed and red tailed) and yes, we have no galahs or corellas (perhaps Mumballup is the only place in Australia where you can get away from them). 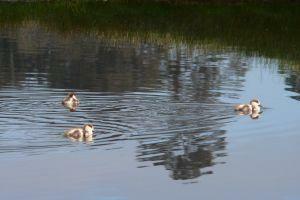 In winter you will see shellducks and maybe a family of fluffy black ducklings on our dam. In summer pairs of the magnificent rainbow bee eater are heard before being seen, tending to their nests along the creek, and on hot afternoons you might spot some emus coming down to the dam for a drink. Smaller honeyeaters, wrens, robins, wagtails and fantails are never far away. Sometimes you can spot an antechinus (marsupial mouse) hopping around the lawn. In the evening a few kangaroos are likely to emerge from the bush above our block; on Summer nights they venture on to the front lawn, but they are wild animals and we like them that way. In the bush at night there are also possums and an occasional chuditch (quoll or native cat) or phascogale (small bushy-tailed possum). Our amphibian population is large and varied. Depending on the season and time of day you will hear and see motorbike frogs, banjo (bonking) frogs, quacking frogs and the rather unfairly named moaning frogs, amongst others. Yes we have a few reptiles; the legged ones (from the big swaggering goannas down to the most delicate geckos) are perfectly harmless; the others we treat with respect. Mumbles is right next to the Bibbulmun Track, just 100m from your door at the property boundary. Follow the track south over Clear Hill and into virgin jarrah forest of the Greater Preston National Park (you can take the car to the top of Clear Hill if you wish; the Track follows the road). Follow the Track north into Sherwood State Forest to the Glen Mervyn Dam and the Yabberup Campsite; from there you can strike north towards Collie, or west along the diversion track to Wellington Dam. All of these routes cross clear running streams in Winter, and abound with wildflowers in Spring. Mumbles is walker friendly, and happy to provide drop-offs or pick-ups for walkers on local parts of the Track. Away from the track, other forest trails provide opportunities for short or long walks, including "Gibraltar Rock", two hours walk to the north east. N.B. DPaW's forest hygiene regulations do not permit vehicles or bikes in these forests. Mumbles is within 30 minutes drive of a variety of mountain bike and canoe trails (see trailswa website) if you prefer. 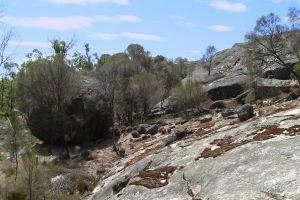 The former includes the Munda Biddi Trail, accessable by road near Collie, in the Ferguson Valley, and just west of Donnybrook. Mumballup has the distinction of being at the geographic centre of the South West, which extends from Perth to Augusta to Albany; no part of this region is beyond a three hour drive. Of course there is plenty to see closer than that, but you can do just about anything in the course of a day trip. North, the Glen Mervyn Dam is only a couple of minutes away, a mecca for water ski enthusiasts. The town of Collie is twenty minutes drive away and has the nearest shops, a water playground and skate park, with the Wagyl Biddi Mountain Bike Trail on the edge of town. Collie is the centre of the State's coal mining industry and has a small museum featuring mining heritage as well as large mines and power stations which continue to operate. The Collie River provides a scenic drive, picturesque walks and picnic spots, still-water canoeing, and backdrop to the town's beautiful golf course (visitors welcome). North of the town the Harris River Dam provides more walking and picnicing; you can stop at the Harris River Estate winery & brewery on your way. South-east, thirty minutes drive takes you out of the Preston Valley and into the catchment of the Blackwood River, flowing through the town of Boyup Brook. The drive is spectacular in Spring, with rolling farmland swathed in yellow canola crops. You can make a short diversion to Woop-woop, just to say you've been there (there's nothing there, as you'd expect). Boyup Brook is home to Roo Gully kangaroo sanctuary, the amazing Carnaby Collection of butterflies and jewel beetles, and a pioneer museum, as well as a sombre memorial to 2500 mostly Australian POWs who perished at Sandakan (Borneo) in WW2. A short distance out of town is Harvey Dickson's Country Music Centre, and a tree marked by the explorer Gregory in 1845. South, a thirty minute drive through the Greater Preston National Park gets you to Balingup with its craft stores and cafes; from there you can head south to the timber towns of Bridgetown, Manjimup and Pemberton, or take a scenic drive via the Old Cheese Factory and Balingup Lavender Farm, along the Blackwood River to Nannup. West, Mumballup's own winery Mandalay Road Estate produces some top wines including a superb durif and a zinfandel. The apple town of Donnybrook is about twenty minutes by road; do some shopping and visit some of the wineries. If you have children the Apple Fun Park is for them; it is one of the Nation's largest playgrounds and it is FREE, 24/7. From Donnybrook you can head south-west to Busselton and Margaret River, or west to the provincial city of Bunbury, with its shops, beaches and Dolphin Discovery Centre. North-west, a 20 minute drive gets you to Gnomesville. 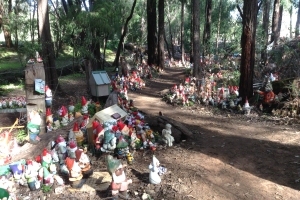 No visit to the area is complete without a visit to this quirky village, the fastest-growing community in the South West and the last refuge of several thousand gnomes which have been neglected, abused or even kidnapped; some have simply wandered away from gnome. Gnomesville has its own Police Station, Girl Guides Group and Rotary Club. Beyond Gnomesville is the Ferguson Valley with its galleries, wineries and boutique breweries; nearby is the King Jarrah tree, Wellington Forest Discovery Centre, and Wellington National Park. The latter includes Wellington Dam, which is a spectacular sight when it overflows the full crest of the dam, usually in September after a sufficiently wet winter; the lake and lower reaches of the Collie River have some beautiful picnic spots, with both still and white water canoeing opportunities. We have a friendly local pub where you can enjoy a drink, or a meal from their extensive all-day menu (all meals are available as takeaways). Further afield, many of the wineries listed above do lunches great and small; restaurants in Collie and Donnybrook open for evening dining. The following table lists some of the events that happen in our area. Unless indicated otherwise, they are also within a 30-minute drive. Dates vary from year to year, so follow the links to check on any event of interest, to confirm timing. Hot weather in March quickly cools toward the end of Autumn, but with little or no rain. Great weather for just about anything! March is Nannup Music Festival time; about an hour's drive away. April brings on the Balingup Small Farm Field Day with everything for the hobby farmer or tree-changer, and lots of craft and produce as well. The Donnybrook Apple Festival happens every Easter. In early May, the Dardanup Art Spectacular features an "Art Trail" at venues throughout the Ferguson Valley. Lambing on the property from late May into Winter. Cool days and cold nights; can range from clear and sunny to overcast and rainy. Good weather for visiting a winery or three, or taking in some of the local craft shops and museums. Lambs bouncing all over the place! The Collie-Donnybrook Cycling Classic passes through Mumballup in mid August, and the Medieval Carnivale happens in Balingup later in the month. If you're still looking for a knight in shining armour or a maiden in distress, this is for you! 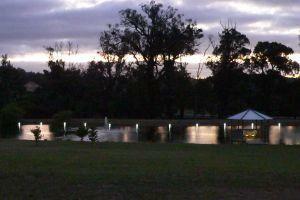 Further afield, the Nannup Flower and Garden Festival also takes place in August. 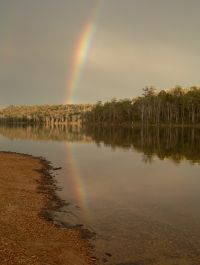 Nannup is about an hour away to the south-west, but a very scenic drive through Balingup and along the Blackwood River. Clear mild days with some frosty mornings early in Spring, warming up later. September is the best time for a wildflower walk on the Bibbulmun Track. The Collie Adventure Race is in early October, as is the Bull & Barrel Festival at Dardanup, followed by the Blackwood Marathon (Boyup Brook to Nannup) later in the month, when you can also pick up Harvey Dickson's Rodeo. The Collie Show happens in November, along with Blues at Bridgetown, a little further away. Spring wraps up with the The Donnybrook Fine Food and Wine Festival in late November. Warm to hot up until Christmas; thereafter fairly hot, usually sunny with low humidity and easterly breezes. Ideal weather for lazing around in either of our shady over-the-water picnic spots, with a picnic or cheese platter and a bottle of the local white! Have a splash around in your canoe, or take a dip if you need to cool off. Australia Day breakfasts in Collie, Donnybrook and Boyup Brook on January 26th. The Boyup Brook Country Music Festival and Ute Muster kicks off in February. Water ski-ing is popular throughout summer at Glen Mervyn Dam, just a click or two from Mumbles.